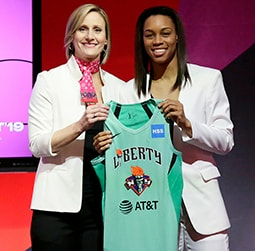 NEW YORK, NY – October 19, 2018 – Amanda Zahui B emerged as an offensive weapon for the New York Liberty this past season leaping in multiple statistical categories following record-low productions in 2017. In her fourth season, the 6’5 center returned to the Empire State with vengeance and managed to reach new career superlatives in the process. Through 29 games played, Zahui B netted 7.7 points per game, 224 total points, on 50-percent shooting tabbing career-highs in all three categories. Her point total nearly quadrupled her production in 2017 and was just 45 points shy of what she contributed during her rookie and sophomore campaign combined. Her shooting clip bested previous yearly performances while her points average trumped last season’s by 5.5 ppg. As the five, Zahui B punished opponents down low but also did damage from distance knocking down 34.4-percent of her attempts from deep. Showing no signs of shyness about letting the rock fly, she drained 21 three-pointers on the year shattering her record of 12 as a rookie. Last season, she only sank two triples and just three in 2016. 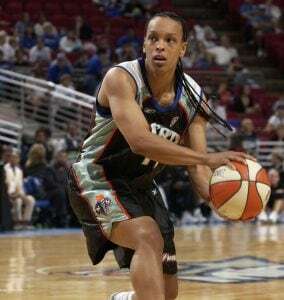 Thriving on the west coast, as part of a peaking three-game stretch, she poured in 14 points against the Las Vegas Aces (6/22) on 6-of-7 shooting and going a perfect 2-for-2 from long range. Two nights later, she posted a career-high 21 points versus Los Angeles (6/24), rattling home the most made field goals in her career. 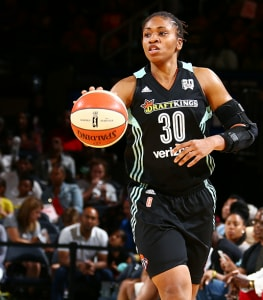 Ending her hot streak in New York, she tallied 10 points on 4-of-8 shooting against the Phoenix Mercury (6/26). In a span of those three games she netted 63-percent of her tries. 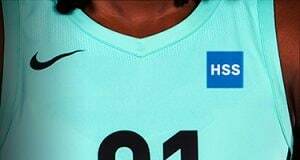 On August 8, she registered her first career double-double against the Seattle Storm comprised of 17 points and a career-high 11 rebounds.